Naveen Ramachandrappa’s practice focuses on appellate litigation, class actions, and other complex litigation. 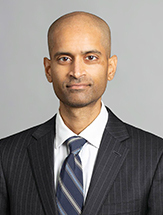 Naveen has argued and won cases before the Eleventh Circuit Court of Appeals, the Georgia Supreme Court, and the Georgia Court of Appeals. Successfully defended a publicly-traded financial company in an appeal involving a noteholder suit to enjoin payment of a $25 million dividend and two separate $100 million tender offers to shareholders. After the district court denied a motion to dismiss, Naveen briefed and argued the appeal before the Eleventh Circuit, which reversed the district court’s ruling and directed that the entire suit be dismissed. The opinion can be found here. Successfully defended a local municipality in an appeal involving First Amendment claims. After the district court granted summary judgment in favor of the municipality, Naveen was retained to handle oral argument in the Eleventh Circuit. Naveen argued on behalf of the municipality, and the Eleventh Circuit affirmed in part and remanded. On remand, Naveen briefed summary judgment, and the district court granted summary judgment in full for the municipality. The plaintiffs declined to pursue an appeal. Successfully defended an insurance company in an appeal involving an issue of first impression –whether the "made whole" doctrine applies to subrogation for property damage claims. Naveen briefed and argued the appeal before the Georgia Court of Appeals and Supreme Court, which reversed the trial court’s ruling and remanded for judgment in favor of the defendant. The Court of Appeals opinion can be found here, and the Supreme Court opinion here. Successfully defended an insurance company in an appeal involving an insurer’s right to seek declaratory judgment regarding an industry-standard commercial crime insurance policy. Naveen briefed and argued the appeal before the Georgia Court of Appeals, which reversed the trial court’s judgment and remanded for judgment as a matter of law in favor of the defendant. The Court of Appeals opinion can be found here. Successfully defended a regional timber company against a products liability claim involving millions of dollars in potential liability. The firm was retained handle a possible appeal. Naveen secured a full summary judgment ruling after arguing the motion before the State Court of Fulton County. The plaintiff declined to appeal. Successfully represented a plaintiff in an appeal involving a nearly $9 million jury verdict against an alarm monitoring company. Naveen had a primary role in drafting the briefs for the post-trial motions, the appeal in Georgia Court of Appeals, and the cert petition in the Georgia Supreme Court – all which went in favor of the plaintiff. The Court of Appeals opinion can be found here. Successfully represented a plaintiff in post-trial motions involving a $73 million jury verdict against an apartment complex. After raising a constitutional challenge to Georgia’s $250,000 cap on punitive damages, coverage of which can be found here, the defendants agreed to settle the case. Successfully represented a plaintiff in an appeal involving a $2.79 million jury verdict against a national grocery store. Naveen handled the appeal in the Georgia Court of Appeals and the cert petition in the Georgia Supreme Court – both of whom ruled in favor of the plaintiff. The Court of Appeals opinion can be found here. Successfully represented a plaintiff in an appeal involving a $3.6 million jury verdict against a national mortgage servicer. After the district court granted the defendant’s motion to reduce the judgment to $756,000, Naveen was retained to handle the appeal. Naveen briefed and argued the appeal before Eleventh Circuit, which reversed the district court and vacated the order reducing the judgment. The Eleventh Circuit opinion can be found here. Currently representing a plaintiff in an appeal involving a $3.25 million jury verdict against an apartment complex. The appeal will decide whether Georgia’s apportionment statute applies to the vicarious liability an apartment complex has for the negligence of its contractors. Coverage of the case can be found here. The case is pending before the Georgia Court of Appeals. Successfully served as plaintiffs’ counsel in a class action breach of contract/RICO case against one of the nation’s largest shipping companies. The lawsuit alleged that the company intentionally overcharged its customers by imposing residential delivery charges for deliveries to non-residential addresses such as courthouses, government buildings and banks. The case, which was pending in the Western District of Tennessee, settled for $21.5 million. Successfully represented an institutional investor in fraud and RICO cases against Bank of America, Countrywide, and JP Morgan. These high-stakes cases involved the alleged fraudulent sale of more than $6 billion in mortgage-backed securities, millions of pages of documents, unusually well-funded and determined adversaries, and complex issues of successor liability. Naveen was part of a team of lawyers, which filed suit in Fulton County State Court, defeated motions to remove and to dismiss the complaint, conducted discovery, and negotiated a confidential settlement in the client’s favor. Currently representing home borrowers in lawsuits against several large banks for improperly charging post-payment interest on FHA-insured loans. The cases are pending in the Northern District of Georgia and the Southern District of Florida. A summary of the case can be found here. Currently representing school teachers in a proposed class action against Dekalb County, Georgia for breach of contract relating to the County’s unlawful suspension of retirement benefits. The case is currently pending before the State Court of Dekalb County. Currently representing former NFL players in a fraud case relating to concussions against the NFL. The case is currently pending in MDL proceedings before the Eastern District of Pennsylvania. Naveen had a primary role in drafting the complaint, which has been described by ESPN as perhaps the most influential concussion-related lawsuit against the NFL. A summary of the case can be found here. Currently representing an inmate in state prison who is asserting claims against prison officials for Eighth Amendment violations in the form of "deprivation of basic sanitary conditions." The Eleventh Circuit has described the case as involving "serious allegations [which] state an Eighth Amendment violation under our caselaw." The Eleventh Circuit’s opinion on can be found here. The case is currently pending in the Middle District of Georgia. Currently representing a former pretrial detainee who had all charges against him dismissed, but who suffered violations of his religious rights while in jail when a local government denied his requests for a vegetarian diet for over a year. The district court denied summary judgment to the government and set the case for trial, when the government sought an interlocutory appeal. The case is currently pending before the Eleventh Circuit. "Golden Age of Torts: Superstar Plaintiff Lawyers"